3 months into 2013 I'm finally posting something new on this blog. I've neglected it for too long, but in my defense I've been concerned with my personal well-being and healthy living in general, which left me with very little time to test and review new inks. As for fountain pens, I haven't bought any in a long time and it's unlikely I will. Although, to be honest, I'm tempted by the new TWSBI Diamond 580. Who knows, I might pick one up with an italic nib. My own Diamond 530 is showing signs of aging in the form of stress fractures around the section, despite using it very lightly. During this time I haven't been completely idle in regards to inks. I still have a sizeable collection of samples that I would like to test, before I can even think about buying new inks. These past few months I have tested 2 inks. 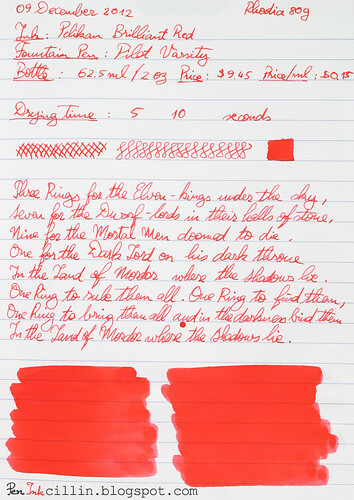 Today's review is about Pelikan Brilliant Red, which is your run-of-the-mill red ink. I tested it in my hardworking Pilot Varsity. Before I begin, a disclaimer. I would like to apologize in advance for the inaccurate color reproduction in the samples. Some inks are harder to transpose to a screen and this is one of them. Since my workflow consists of photographing the sheet of paper (as opposed to scanning it), and then correcting the colors in post-processing, additional errors are sometimes introduced. Additionally, I do the processing on my good monitor, which tends to reproduce colors more accurately (as far as my eye can tell) but when I view the image on my cheaper monitor, it sometimes looks awful. Just be aware that color reproduction varies from monitor to monitor and eye to eye. 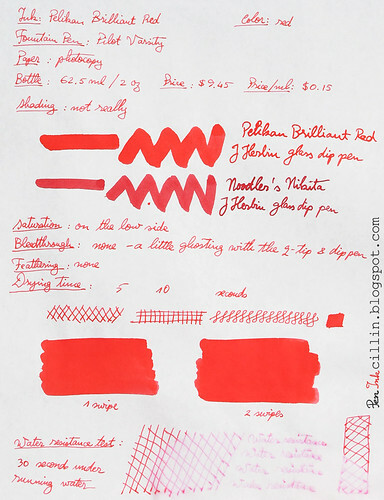 Pelian Brilliant Red is almost as cheap as Noodler's inks. It comes in a 62.5 ml / 2 oz bottle and costs $9.45, or $0.15 per milliliter. As the name suggests, this is a bright red ink. I didn't find it highly saturated but it is rather bright. This is where my samples don't quite reflect reality. To my eye, the samples tend towards orange, while in reality the ink is actually a very neutral red. In addition, the samples are more saturated than the actual ink. I compared it to another red ink I own, Noodler's Nikita, and the difference is obvious: while Nikita tends towards pink, Brilliant Red has a warmer and more neutral red tone. Out of the two I believe I prefer the Pelikan ink. Pelikan Brilliant Red doesn't have any shading, being completely flat. Since the ink is not very saturated, it doesn't bleed either. Of course, there's some ghosting when applied thickly with a q-tip or the glass dip pen. Pelikan Brilliant Red flows well in the Pilot Varsity. It's not too wet, nor dry. I assume that, being produced by one of the big ink brands, its properties are engineered to be very dependable and this is definitely the case here. Pelikan Brilliant Red dries quickly on regular (spongy) photocopy paper, somewhere between 5-10 seconds. On better paper, such as Rhodia 80g, drying times are comparable. This is not a water resistant ink and it shows in the water test. Within 30 seconds of being exposed to running water from the tap, most of the ink has washed off. You can notice some pink undertones when this happens. Pelikan Brilliant Red is a decent, well behaving, non-water resistant ink. I would call it fairly average because it doesn't distinguish itself in any aspect. It simply performs. If you need a no-fuss red ink that is guaranteed to work well with any fountain pen, but are not interested in water resistance or other exotic properties, I would heartily recommend Pelikan Brilliant Red. Finally, here are the two samples on photocopy and Rhodia 80g paper, respectively. Thank you for the excellent review. When it comes to a basic red, though, my go to ink is Sheaffer; I'm never disappointed. As for the color differences, to me the Sheaffer is a truer red. Of course, I don't know how accurately my screen is showing the Pelikan Brilliant Red. Also, if the Pelikan Brilliant Red writes like Pelikan's Royal Blue, Brown, Violet, and Brilliant Green, all of which I have, then I am guessing it is a drier writing ink than the Sheaffer Red. Not an overly dry ink but not as wet writing as the Sheaffer. Hey Freddy glad you're still following the blog! I believe you are right about the Sheaffer. Maybe one day, when I finish testing my remaining samples, I can give it a try. The Pelikan inks I've tried so far, including Brilliant Green, did feel a little dry. Not too much but more than I would like. You're back!!!!!!! I was most excited when my reader told me there was a new post here :D Lovely review, I think this is actually the first I've seen of this interesting and blinding color hehe. You weren't kidding when you said there's no shading. I can't stop staring at it though. Thanks, it feels good when people miss me :) I'm gonna take it easy with ink reviews because, like I said, I've got other things in mind but I still want to review all the samples I got, which is plenty. Anyway, with regards to this ink, the photos don't quite tell the correct story and I apologize for that.